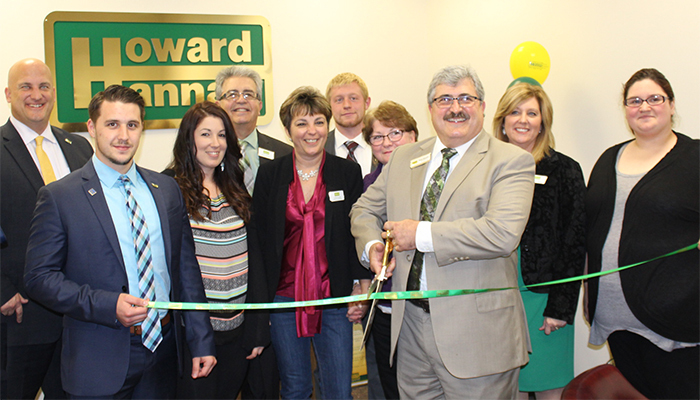 Towanda, PA (November 30, 2016) – Howard Hanna Realty Pioneers has opened a new office in Towanda at 1 Elizabeth Street. The grand opening and ribbon cutting ceremony was held November 30, 2016. This is the first office for Howard Hanna in Bradford County. Howard Hanna Realty Pioneers has been serving home buyers and sellers in Towanda/Sayre and its surrounding markets, giving broker/owner Thomas Saveri reason to open an office here to improve access for both new clients and sales associates. Realty Pioneers was founded by Saveri in 2008 in Wellsboro, PA and quickly became the leading real estate company in the Northern Tier of Pennsylvania serving Tioga, Potter, Lycoming and Bradford Counties. Realty Pioneers partnered with Howard Hanna Real Estate Services in 2014 through Hanna’s franchise program. The relationship with Howard Hanna provides buyers and sellers with unique programs and services that are not available from other agencies such as the company’s 100% Money Back Guarantee. In addition, agents benefit from state-of-the-art marketing tools, training and technology. Howard Hanna Real Estate Services is the third largest real estate company in the United Sates and the #1 seller of homes in Pennsylvania, New York and Ohio. Howard Hanna has 271 offices located throughout Pennsylvania, Ohio, New York, Michigan, Virginia, North Carolina, West Virginia and Maryland. The Howard Hanan Realty Pioneers Towanda office is managed by Raul Azpiazu, a veteran real estate professional and longtime resident of Bradford County. Raul can be reached at 570-460-5876 or raulazpiazu@howardhanna.com. Managing the Wellsboro office is Carol Hoke. Carol can be reached at 570-623-6100 or carolhoke@howardhanna.com.